"Are you wearing something DIY-able today?" I'm not sure that's even an appropriate question, but Kaitlin always humors me! Her Anthropologie wardrobe is just so inspirational!!!!! I'm really loving this top. Constructed out of a beautiful silk, the shape is so striking! Definitely something I want to look into DIY-ing... Do you know of a similar pattern? While I'm doing that, enjoy another episode in Kaitlin's search for Mr. Wonderful! As we continue on my dating journey, it is important for me to introduce you to Man of My Dreams (No. 2). This was a particularly sticky situation. Have you ever found yourself in the friend zone? It is an uncomfortable area to be in when you have strong feelings for a person, especially when everyone else thinks you’re a couple. Man of My Dreams (No. 2) came in to my life during my junior year of college. I studied abroad, thinking I would meet a dreamy Welsh man, but ended up finding an American in Wales. It was the perfect scenario. We flew in to the same airport, got on to the same bus, and discovered we were in the same program. It was truly serendipitous. Shortly after arrival, we became the best of friends. There was just enough for me to think that it was going to go in the direction of a relationship... while he was thinking there was just enough for us to stay the best of friends. Ladies, communication is the key to any successful relationship. This relationship absolutely showed me that. With too much of a gray area (for example, I don’t think that "friends" kiss), we had a falling out. Looks like we were on the search for MOMD (No. 3). Ahhhh... the life of a single girl. I love hearing about her e-Harmony experiences. She'll be sharing those with you, too! 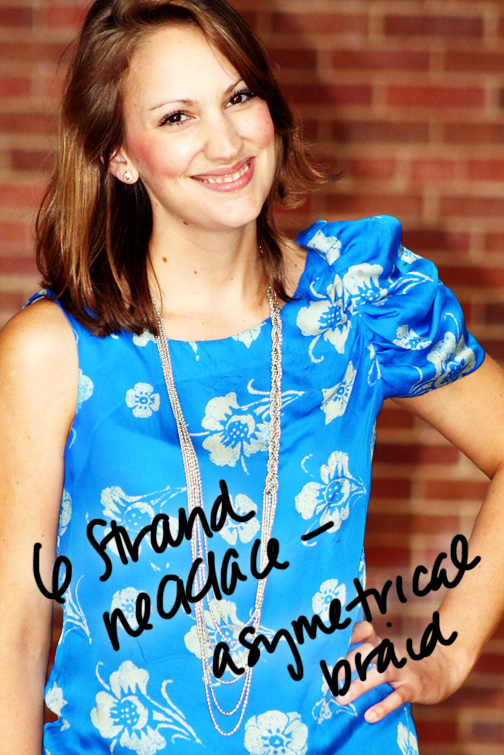 One more point of DIY inspiration in closing... this awesome necklace!